I have a pretty cool job, at a pretty cool place. and that’s good enough for me. But sometimes something really cool happens at my job that makes me giddy. It just so happens that one of these things has happened! 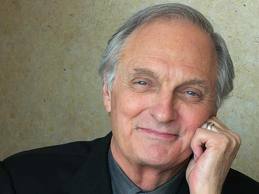 Alan Alda is coming into my office in a few weeks and I’m totally stoked. You’re all asking: are you a really be fan of M*A*S*H? No, I’m not, but I was a somewhat regular viewer of the PBS show Scientific American Frontiers when I was growing up. Something that I’ve always admired about Alan Alda is that he’s an artist (an actor) that spends a lot of time explaining and promoting science. I actually once read him referred to as “actor and science communicator” because that’s what he does. He himself isn’t really a scientist, he just communicates the science, and makes it interesting and digest-able to laypeople. 2) Alan Alda. Because He’s so genuinely fascinated by the science and I gotta love him. Did I get to the point yet? He wrote a book about Marie Currie and I work for the company that’s publishing it. And in a few weeks he’ll actually be coming into the office to meet everyone. I have friends who claim they’re used the secret to make things happen. Perhaps this is my own version of that.